The dance company I am part of - Cycropia Aerial Dance - is putting on a big, fun show this week Thu-Fri at Madison's Orton Park Festival. 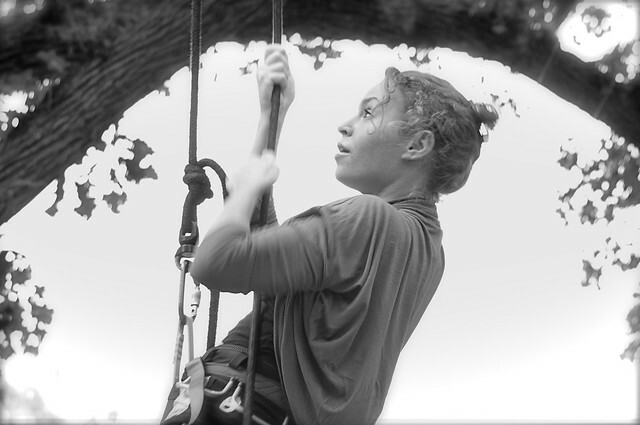 We perform a fantastic show with all our aerial apparatus rigged in a sprawling Burr oak tree. Since we have to rig the tree in advance of the show so we can get a couple of rehearsals in the actual space, we also teach our class there so that new flyers can get a taste of what it is like to fly in the tree, and experienced flyers can show them the ropes, so to speak. It is a jam packed weekend of rigging and site prep and rehearsals for every piece and transition act jammed into the daylight hours. Our dress rehearsal is Wednesday night, and the performances are Thu and Fri. The show is free and we play to a large (2,000+) audience, and we pass a hat (metaphorically) for donations, which are typically generous. Aerial dance takes muscle and the bodies of the experienced dancers show it. There is no surprise that tank and racer-back tops are popular attire! We men-folk find ourselves in snug tee-shirts and sleeveless attire too. *grin* There is a LOT of work involved in those muscles and I see no reason not to show them off. If you are in the Madison, WI, area this week, come and see a great show! Here is a link to a SLIDE SHOW with a large batch of photos from the class and a rehearsal.